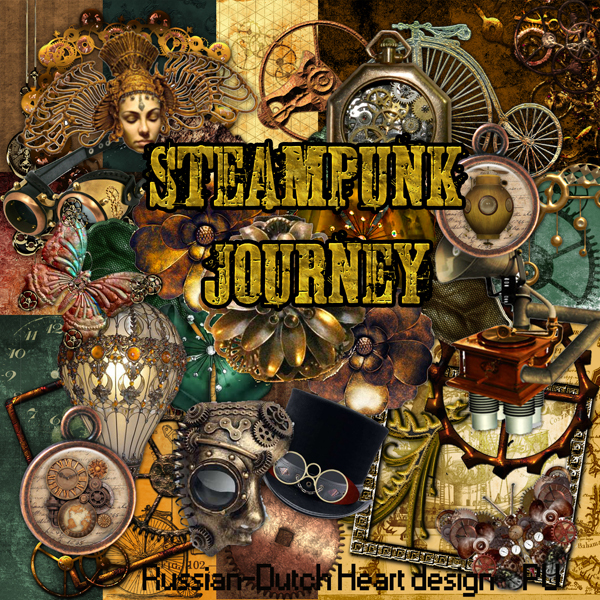 With a Russian/Dutch heart: Had a bit of "misfortune"last week. Had a bit of "misfortune"last week. I actually planned to post yesterday already, but after reading some blogs and answering mails, I just had to quite because my back hurt. Last week Wednesday afternoon was all happy and sound till i had to change a bag of the bin in the kitchen. Probably made a wrong move or so and in a second a muscle said "PING" and it wasn;t pleasant. Sometimes is goes away after some minutes but this one wanted to stay. So trouble moving and sitting, oh boy, I wasn;t happy. 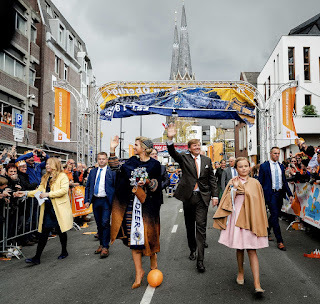 And it just happened before our Kingsday (on Thursday) and we wanted to go to one or two fairs. No way with that back. D........d! I still have trouble but every day it is going somewhat better, so i guess i just have to kind of sit it out. You should see Jan and me at the moment. Jan is recovering also from some real bad back trouble, not yet over, but already better and now I have it too. Jan has it on the left at the moment and mine is on the right, so together we have still two halves that work rather well. 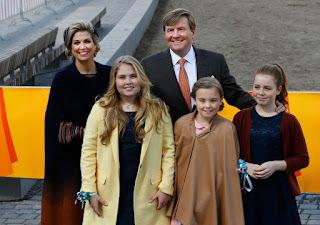 Kingsday this year was a bit special, because our king became 50 years old. 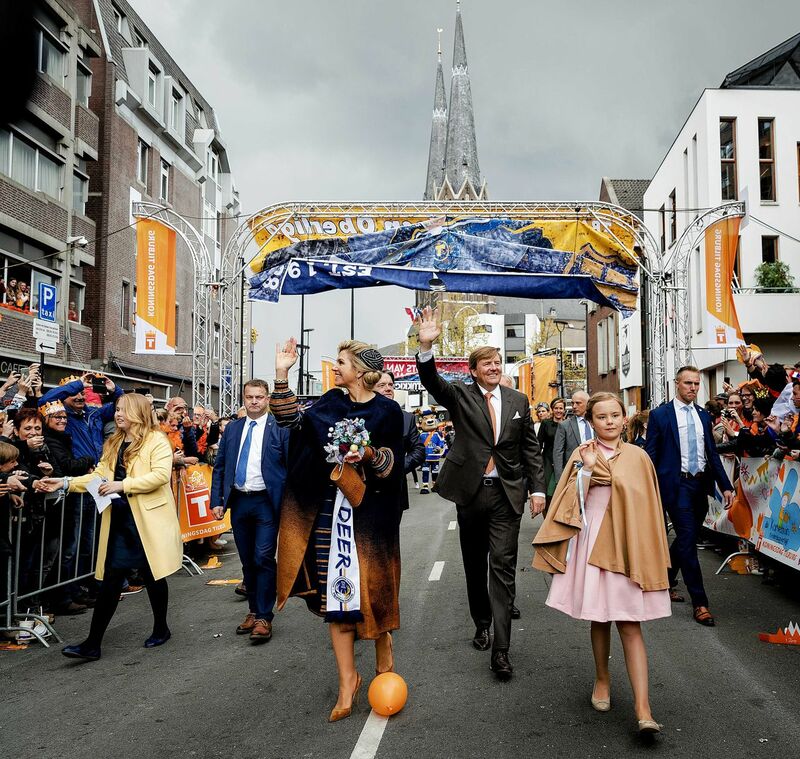 He still looks fine and his wife our queen Maxima is still a beautiful women. And their 3 daughters are getting older too, of course. If you want to read a bit more of it here is a link, where you could also sea/hear an interview with our King, very openharted. Weather here is still a bit on and off. Igt is getting somewhat warmer, but not to be jumping of joy about it LOL. So sometimes when there is some sun and not too much wind, it is nice to be in the garden for a moment, but that's all. I made a few photos, there's isn;t yet all too much to take pictures of. 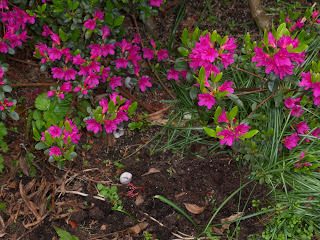 But I have one of the little azalea I have, I just LOVE that color! 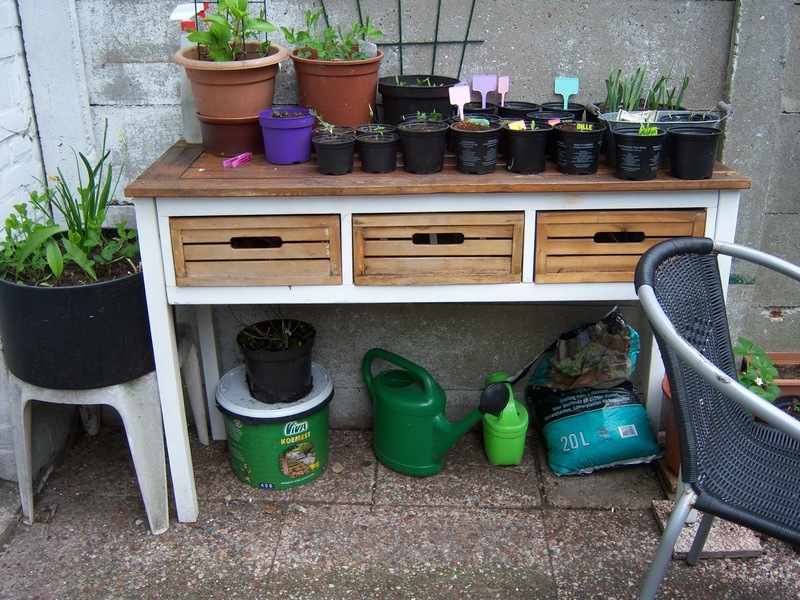 And have a photo of the potting table Heidi gave us when she moved to her new house(she has no room for it on her balcony). 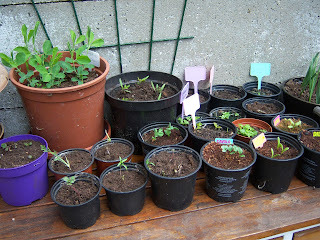 And on it you can see a part of our seedlings. ou can almost see them grow now every day a bit. still for some there's still a long way to go to come to the point of blooming, as e.g. our tomatoe plants. We will see if we will have tomatoes this year, I am in some doubt, but nature always surprises you. So we'll see and wait. Okay, it is about time I quite, because I must give my back a bit of rest and sit in another position. I have a first part of a kit for you, it becamse a bit "heavy"so split it in two. Next post, I hope it will be coming weekend again, you will have the rest of it. This time it is a steampunk kit. 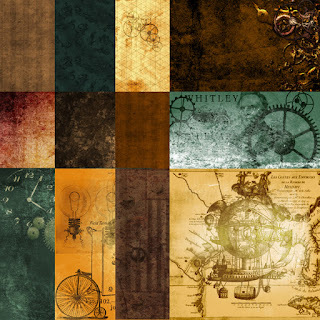 I give you a preview of the papers and of the whole kit. Have fun with it. You have a fantastic week, take care of yourself and your loved ones! Oh my goodness, I do hope your back heals soon. I had to giggle though, that between both you and Jan you had two halves that worked. At least you still have your wonderful sense of humor. I'm sad to hear that you could not make it to the fairs, but oh my, what a beautiful potting table you have!! And your planted seedlings look wonderful. 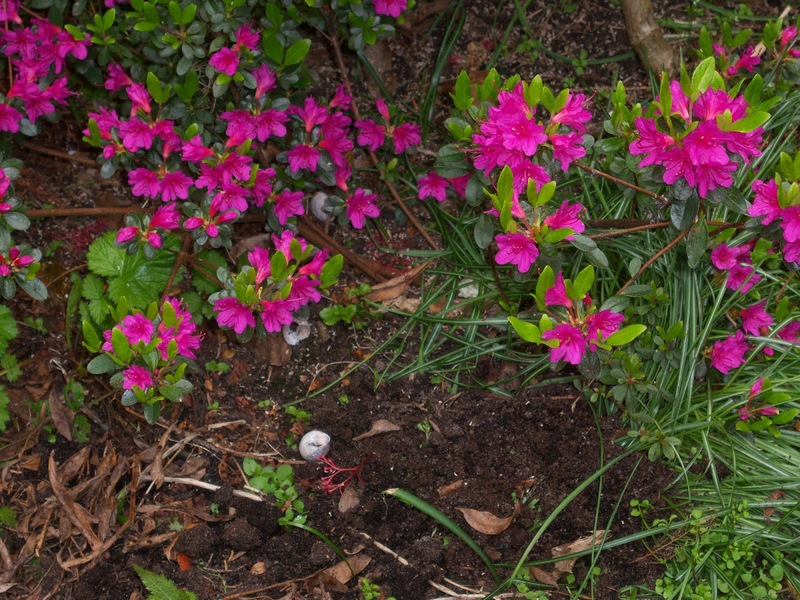 I have a little azalea that is the same color as yours. Mine hasn't started to bloom yet, but pretty soon I hope. Your new kit looks to be very interesting indeed. Thank you, I'll have to see if I can make a nice quick page with it. Kyra, you take care of yourself and rest as much as possible. Now I must go post on my own blog. You have a wonderful week my friend. Hugs, Edna B.
Hello and Thank you for this lovely download Kyra. I'm really sorry to hear about your back, hopefully it will feel much better soon. Thank you for the new kit. I'm working with pictures that are costumes built by my friends in California along with my Grand daughter. These items in the kit will fit them just fine!!!! Thank You Kyra for the lovely kit and also the pictures of your King. I find it very fascinating to see the pictures and want to check out the link as soon as I get home from doing laundry today. Oh my what a beautiful potting table. So kind of Heidi to give it to you. I know that you can surely put it to use. I am so very sorry to hear of you an Jan both having back pain. It can really be painful and having to constantly watch how you move around really can be irritating as many times you forget and then remember with a sudden grip of pain.